This was another item on the 40at40 list this year that I was not sure I’d get done. Most conventions of this type I hear about happen in The States. Yet Sci-Fi has played such a huge part in my life, especially when growing up, I felt compelled to include it. I have been fascinated with science fiction since before I can remember. As a child, my agnostic Dad taught religious education in a Coventry school while not really believing the half of it himself. Our bookshelves were filled with all kinds of religious texts, science texts, and those that lay somewhere in between. I remember before I understood them, looking at the covers of a series of Erich von Däniken paperbacks. The Swiss author and his controversial claims about extraterrestrial influences on early human culture were being continually questioned. Yet they led me to start a collection of Sci-Fi. Comics, Star Wars magasines, The Usborne World of the Unknown: UFOs. Then onto Azimov. I just liked the ideas. With my strict Roman Catholic Grandmother prying prayer time and heavy religious ideas into my head, I liked to have a backup concept. Some foundation of pseudoscience I could lay a confused religious ideology on. If I could think of Jesus as a spaceman, a Jedi. It all made more sense. Escaping into a book is one thing. Escaping into a book whos story takes you a long time ago in a galaxy far far away.. and yet they already have jetpacks! Now that’s escapism. These authored thought experiments had me hooked. So much so that everything I wrote at school, even if kickstarted with the teachers paragraph, had my protagonists waking up in a lab on a space station or defusing a meteor bomb on a collision course with my stuffy classroom. I was five years old in 1977. That was the year the cinema really began to mean something. I saw The Hobbit. A crude animation on reflection and pretty scary as i recall. And then of course there was Star Wars. Star Wars ‘A New Hope’ and the following two films shaped my imagination, my play, my Sci-Fi fascinations. 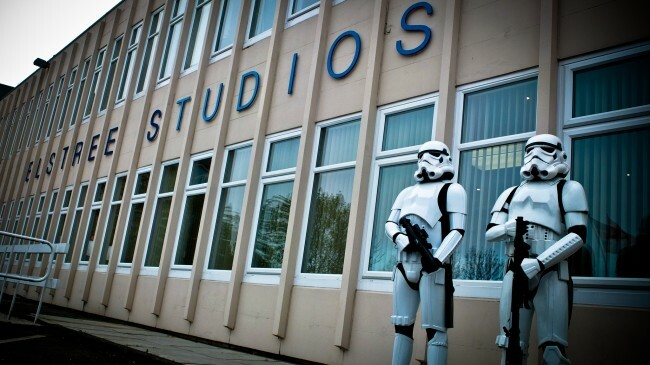 So when I saw there was going to be Star Wars convention at Elstree Studios I had to go. 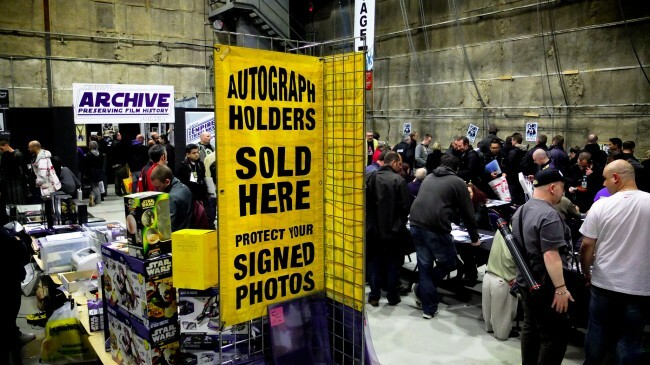 The convention was called Elstree Empire Day and it was just as much about the props and production as it was about the story and those who played apart in it. The Gold ticket I bought was £110 and entitled me to ‘free’ autographed photos. 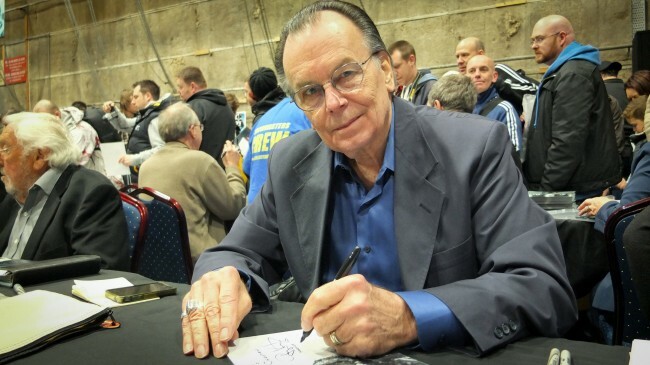 I got to meet the producer Gary Kurtz, we had a really interesting chat as I appeard to have caught him before anyone realised who he was. 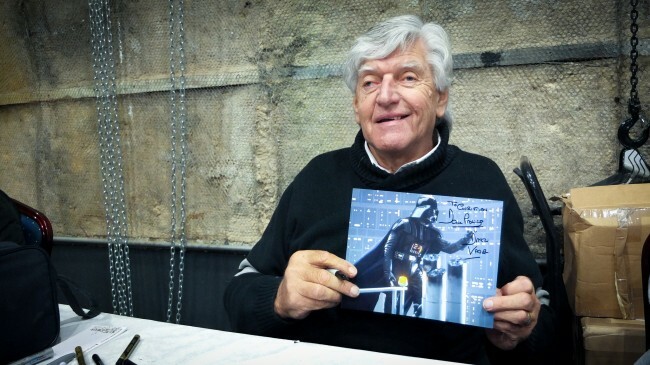 We talked about his photography, the gear he used all those years ago and his disagreements with George Lucas. I left feeling he was a thoroughly nice chap. 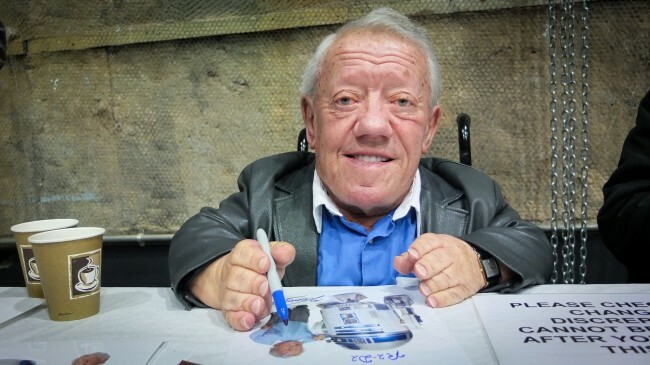 I also got to meet a Storm Trooper, R2-D2, Darth Vader, Dak (who also played Bobba Fett) and loads of other guys from the film. I also got to queue up alot. I’ll leave you with the audio I recorded as I was leaving. It should paint a decent picture of my experience.